The Xtar Rocket SV2 is the fastest two bay charger that Xtar has to offer, taking only 1 hour, 30 minutes to fully charge a 2500 mAh 18650 lithium-ion battery. It has two independent charging bays and can charge lithium-ion / IMR / ICR / INR and NiMH / NiCD type batteries with a choice of four charging currents up to 2 A. 10440, 14500, 14650, 16340, 17335, 17500, 17670, 18350, 18490, 18500, 18650, 18700, 22650, 25500, 26650 and 32650. For charging 3.6 V or 3.7 V lithium-ion batteries only. Note: This product ships with a UK Wall plug. Always use in accordance with instruction manual and read before first use. 1. 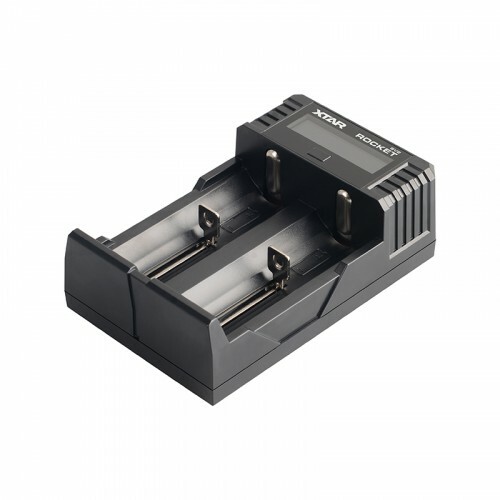 Charge only rechargeable 3.6/3.7 V li-ion (IMR/ICR/INR) and NiMH batteries.